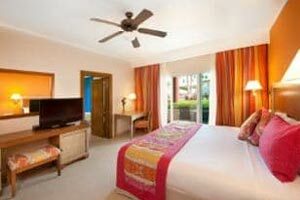 The IBEROSTAR Punta Cana hotel has 427 comfortable and luxurious rooms equipped the way a 5-star accommodation should be. 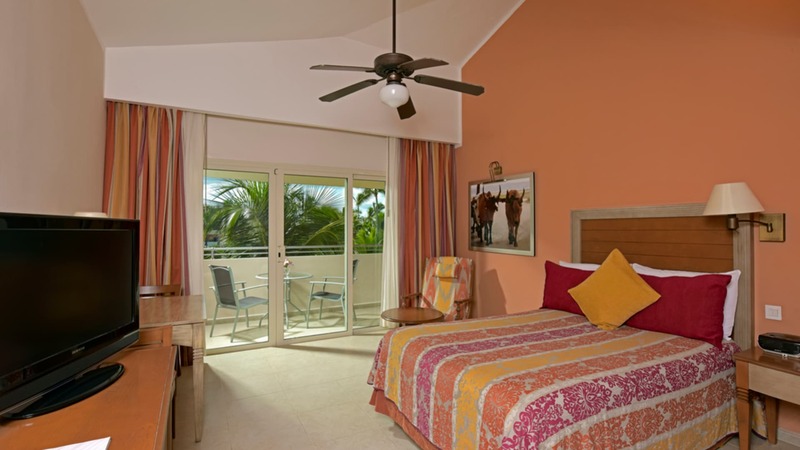 Divided into 334 standard rooms, 13 family-sized rooms and 80 suites, customers can choose the room that best suits their needs and expectations to enjoy an unforgettable vacation in Playa Bavaro. 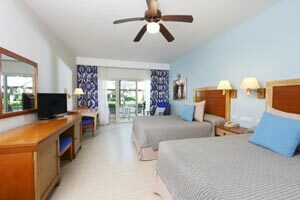 The Standard Room at IBEROSTAR Punta Cana is a spacious 400 sq. ft. guestrooms exquisitely furnished with 2 double beds or 1 king bed and a private balcony with views to the garden. To accommodate travelers with disabilities, this room category has 5 handicap suites available. The Standard room offers digital safe, flat-screen TV, alarm clock radio, air-conditioner and ceiling fan, minibar, coffee maker, iron and ironing board. The spacious suite bathroom has a vanity sink, shower/tub combo, and hair dryer. 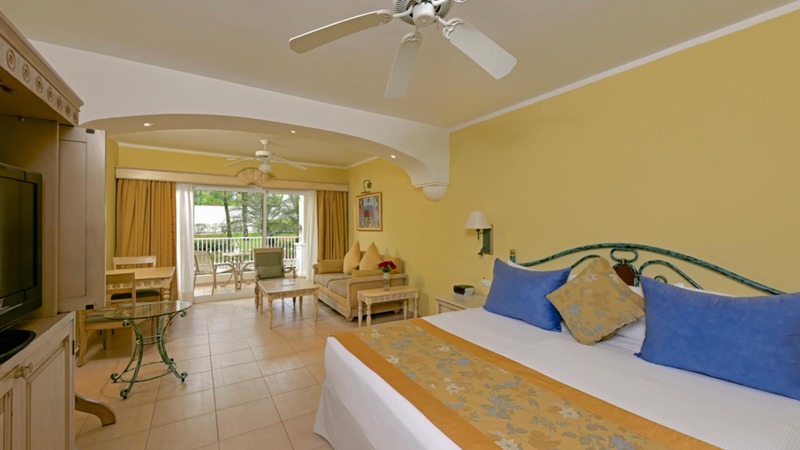 IBEROSTAR Punta Cana presents this beautiful and comfortable room. The Ocean View Standard Rooms have a total space of 400 sq. ft. and feature 2 double beds or 1 king bed with private balcony and ocean view. Maximum occupancy: 2 adults + 2 children or 3 adults + 1 child in existing beds. The room offers a digital safe, LCD TV, alarm clock radio, telephone, air-conditioner, ceiling fan, minibar (soft drinks, beer and water), coffee maker, and iron with an ironing board. The Ocean View Standard room features a vanity sink, shower/tub combo and a hair dryer. 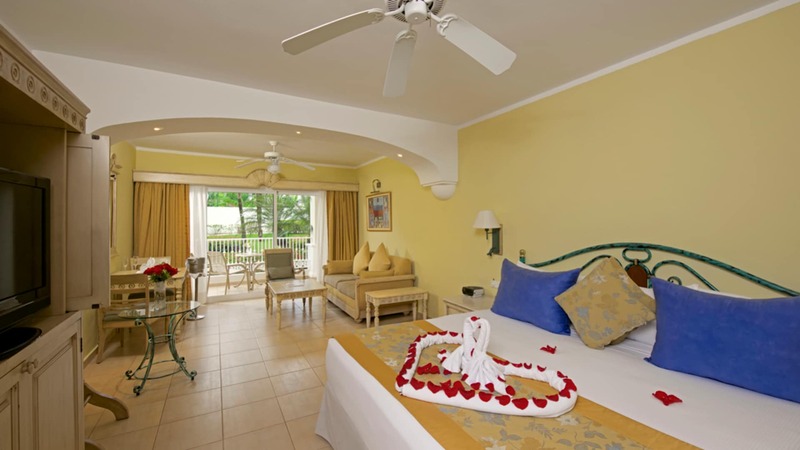 IBEROSTAR Punta Cana presents a room specially designed for couples. The Romantic Junior Suite boasts 488 sq. ft. of pure romance and comfort. The spacious suite features 1 king bed and a private balcony with garden views. Maximum occupancy: 2 adults 1 child and 3 adults in existing beds. Amenities include a digital safe, LCD TV, alarm clock radio, telephone, air-conditioner, ceiling fan, minibar (soft drinks, beer and water) and a coffee maker. The beautiful and spacious bathroom includes a vanity sink, shower/tub combo, bathrobes and slippers, hair dryer and an iron and ironing board. Welcome gift: Discover sparkling wine and a fresh arrangement of flowers waiting for you. Romantic turndown service: To make your night extra special, the hotel staff will turn down the suite's bed linen with a romantic surprise, once per stay. 20% Discount on one romantic dinner on the beach: Take romance to the next level with this discount on a special beachfront dinner experience (once per stay). Beach towels: There is no need to worry about beach gear; a set of beach towels is available inside your suite. The Family Room has 489 sq. ft. of comfortable suite space. This suite is reserved for families traveling with children (up to 12 years old) and/or teenagers (13 to 17 years old). It features 1 king bed and the second bedrooms has two double beds, 1 pullout sofa and a private balcony with garden or pool view. The suite is conveniently situated close to the kids Club. Maximum occupancy is 2 adults + 3 children or 3 adults + 2 children or 2 adults + 3 teenagers in existing beds. Note: Minimum charge, 3 adults. The room includes a digital safe, LCD TV, alarm clock radio, telephone, air-conditioner and ceiling fan, minibar (soft drinks, beer and water), coffee maker, and iron and ironing board. This shared bathroom comes with a vanity sink, shower/tub combo, and hair dryer. Family welcome kit: We’ve got a little something for everyone in the family. You and your young ones will enjoy a special surprise upon arrival to your suite. Gaming console: Stay entertained with video game options in-suite. Children’s minibar: Find a selection of snacks and beverages specially selected for the little ones of the family.